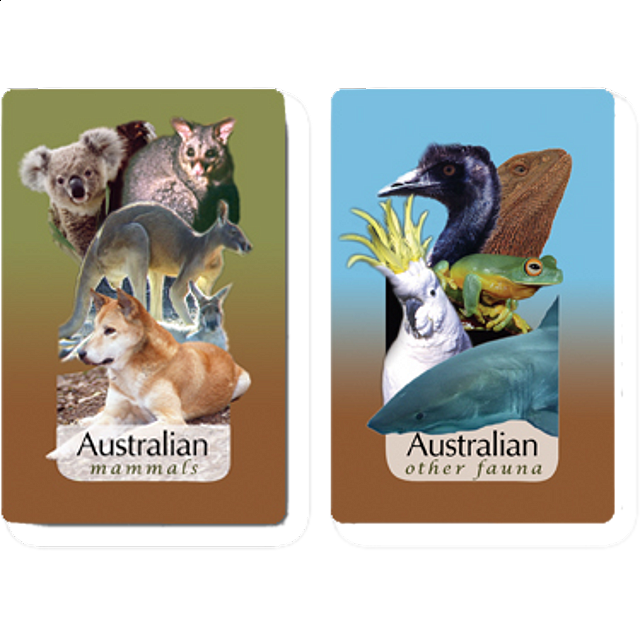 Our double deck of Australian Wildlife Playing Cards features over 100 pictures of Australian wildlife with 54 Australian Mammals and 54 Other Fauna. Learn while you play. Detailed information about each mammal appears with where each lives, their habitat, the food they eat, social habits, size, features, reproductive patterns and their present status. Location: Eastern Australia and northeast Tasmania. Habitat: Relatively wet forested areas to inland plains. Size: Males grow up to 3.5m long with tail and weigh up to 70kg. Females are half the weight. lip and the nostrils (other kangaroos do not). Reproduction: One joey at a time, leaving the pouch after 10-11 months. Location: Southeast Australia, from South Australia to southeast Queensland. Habitat: Edges of fresh water swamps and rivers in broad range of habitats, from rainforest to sclerophyll forests. Food: Frogs, mice, lizards, birds and fish. Size: Generally up to 1.5m in length. Features: Active during the day. Generally hunts and lives on ground. Reproduction: Up to 40 live young, average being 20. Status: All Australian snakes are protected. Our Australian Wildlife Playing Cards are a unique and interesting way to learn about all the wonderful and strange mammals that you can find Down Under.